350. COBHAM to the QUEEN. Having heard from Mr Stafford your Majesty's pleasure that I should certify the king of your sending him to Monsieur with directions to communicate your mind first to his Highness as a matter more peculiarly pertaining to him, I 'procured' to have access to their Majesties. Which being on the same day granted, I repaired to 'St. Moro,' a house of Queen Mother's building about five miles from Paris, where they first brought me to her. I informed her how, having heard tell of her sickness, you had commanded me to visit her and show her grief at the indisposition of her health. Therefore, to satisfy you, I came to wait on her to receive from her own mouth the assurance of her recovery. She first lamented the cold, cough, and 'murre' wherewith she had been, and is yet, somewhat diseased ; acknowledging with many gracious words the sundry friendly demonstrations you have shewn towards her, so far that nothing could be required, saving in one matter, that is the desired resolution of her son's suit, which they expected to fall out according to their wish. Therewith she said : 'You see, Ambassador, into what matters I ever fall,' and so enforced that purpose with many earnest words. I then declared how I was likewise commanded to let her know how it had seemed convenient to you to send Mr Stafford to Monsieur, with commission to impart certain affairs touching his own particular desires ; wherein you wished he might be first satisfied, and subsequently their Majesties made privy thereto ; hoping that they would like this manner of your proceeding with her son. She seemed in countenance to be content with it, and saying she was pleased that the matter yet continued, since it appeared your Majesty liked to entertain the services of Monsieur, whereby she hoped to receive some comfortable fruit. With this she enquired whether the Prince of Condé was in England. I told her that I could not signify so much to her. She certified me that M. Mauvissière had written of it. His servant was come to the Court that morning, and she and the king with some others of the Council were in conference about the letters he brought ; wherein I hear he had 'enlarged' the negotiations of Monseigneur passed there, and certified the manner, place, and company wherewith and whereat the Prince arrived. Thence I was accompanied to the king, to whom, since he had likewise been sick, and was at that instant not thoroughly well, I performed the like 'offices of visitation' which I had used to the Queen. I 'consequently' imparted further to him, as I had done to his mother. He said he hoped that after his brother had been contented with the news which Mr Stafford brought, he would impart it to him ; meanwhile he would rest with the desire he has had, and thinks himself bound to you for the continuance of your good demonstrations towards him and Monsieur. He required me to signify to you how he had been advertised that the Prince of Condé had arrived in England, with whom he hoped you would so deal that it might appear he should not receive further satisfaction than the strait amity between you might comport, nor that he should be animated to persist and enforce his manner of disobedient dealing. I said I thought he might be assured that if the Prince of Condé happened to come into your realms you would proceed in like manner as with M. Bouchart, so that though the first appearance might move suspicion the consequent confident clear dealing would fortify a further goodwill between your Majesties, since you not only misliked the taking of arms, but left them to the king's mercy, in which sort only you would give such comfort to their cause as to mitigate his indignation against them and so obtain them grace, to persuade for a peace, and shew the fervent desire you have that his dominions were restored to an assured repose. 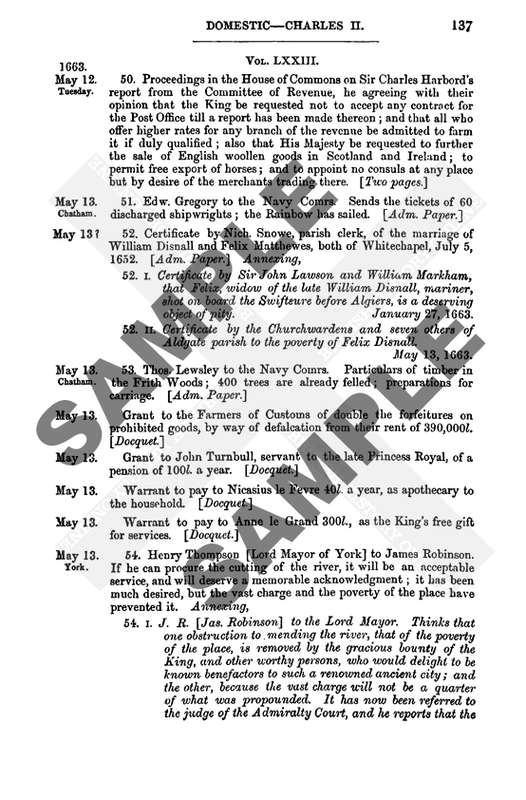 After I had made thus much of my dispatch to your Majesty, I received your further commands by a letter from Sir Francis Walsingham, upon occasion whereof I have declared to their Majesties, finding them in one chamber 'set' together, how for avoiding the opinions which sundry curious devisers would frame on the receiving of the Prince of Condé, you had commanded me to signify to them how you found the Prince's arrival very strange, being come into your realm without your foreknowledge. Therewith you had acquainted M. Mauvissière, sending for him to be present when the Prince first had access to your presence, that he might not only see what passed, but hear what was delivered in speech ; whereby the cause of his repair and the favours he sought should not be hidden from their Majesties. And since, it seems, many grievous complaints are alleged, showing bad attempts moved and indignities offered to the person of the King of Navarre and the Prince, as also that those of the Religion have been 'streighted of their exercise' and in some places cruelly murdered, your Highness wished him to 'put in ure' the intention of his royal mind, professing the maintenance of the public peace ; which might the more happily succeed if those were somewhat removed from his favour who under the cloak of his good service procured the expense of his treasure, the grieving of his ancient nobility, the impoverishing of his subjects, and with his own forces weakened his estate. But as I acknowledged his own wisdom to be such that all was better understood by him, I did not presume to deal in the particulars. Your intention was to show your desire for the appeasing of these troubles in France, wherein you could be content to employ yourself in such sort as might be agreeable to them ; not meaning to interpose in their affairs otherwise than they shall like and embrace. I received many thankful words from them both for this manner of dealing. The king said you infinitely bound him therein ; he desired that you might persuade the Prince to return to France, and that he might not receive means whereby he might be enabled to do otherwise. My answer was that as you had openly received the Prince, so you would not suffer anything to pass more privately which might discontent them or 'annoy their quiet.' Now, however, that you had thus, as it might be said, shown yourself 'slow affected' towards the Prince and others of the Religion, it seems 'princely done' if they should make a new demonstration of grace upon this frank friendship shown by you, whereby the mutual amity would be better known to your subjects and those of France ; and I besought the Queen Mother to help with her entreaty to the king. But they agreed in desiring that the Prince might be returned to Rochelle, and so to Saint-Jean d'Angely. I said he had power to move your Majesty any way herein ; but it seemed that could not well be offered to the Prince, considering that all persons in misery are in some way to be succoured, and not suffered to return to the fire wherein they burnt. If they would make a new show of their especial grace I thought you would deal for their satisfaction so far as might be. To this the king said that he had given his brother ample power to renew the pacifiction ; yielding you thanks for your favours, counsels and offers, which he would 'enforce himself' to deserve.— Paris, 2 July 1580. 4 pp. France IV. 108. 351. COBHAM to [the SECRETARIES]. 352. COBHAM to [THE SECRETARIES]. 357. EDWARD STAFFORD to [WALSINGHAM].